At England Piano we pride ourselves on providing the best possible services to each of valued customers. Our experience at England Pianos was beyond exceptional, from purchase to delivery! The process was seamless and so pleasant! 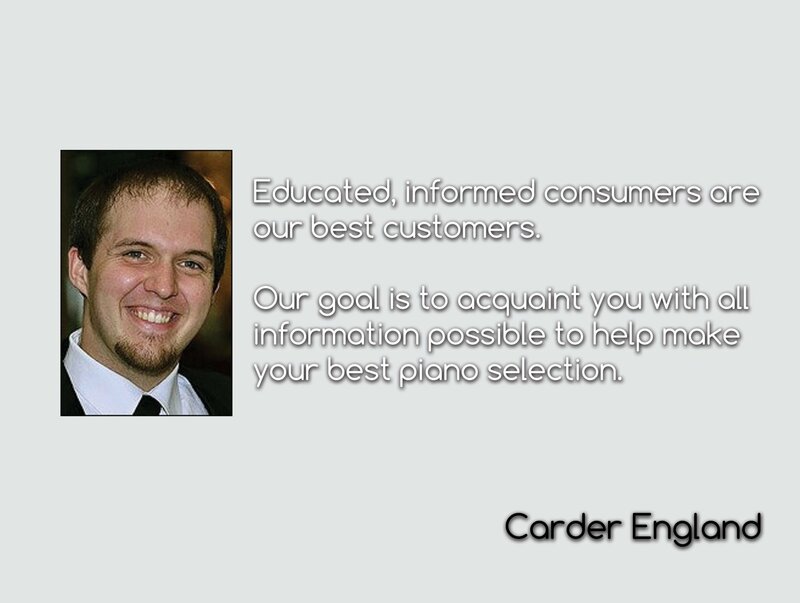 We enjoyed working with Carder. His expertise, attentiveness to detail, care and consideration for the customer were witnessed in the best ways amidst the details It is a wonderful blessing to be able to witness a local, family owned business shine as England Pianos does here in Atlanta and throughout the nation! Thank you to the amazing team at England! Keep shining as you do! I just bought a Kawai grand gx-2 from England Piano. I had shopped around at other places and did my research. It was a big decision, I'm particular, and the search for the right piano can be nerve racking. But David, the owner, was very nice and gave me the information I needed to move forward to finding my piano. He was patient, honest, very knowledgeable, experienced, and accommodated me to my level of playing. His process also afforded me the opportunity to play the piano before delivery to adjust the tone and touch of the keys to the degree I felt most comfortable playing. I was very pleased with my overall experience and I love my piano. I feel confident in continuing to work with him for future tuning and maintenance. I was surprised with how easy the delivery and the set up went as well and the guys were very professional. They even wiped down my piano, and made any final adjustments to its location in the room. I would definitely recommend England Piano. A piano is a huge investment and I finally found that piano I will enjoy for many years. I'm having a ball with my new Kawai CP1. I learn something new every day. I find that it really helps I have had my Technics KN6000 for 20 years plus. So many functions are similar. Then again, some are different. I try to figure them out and if I can't, that's when I resort to the owner's manual! In addition to the variety of sounds the CP1 produces, everybody is very impressed by its appearance. Alone, it's a beautiful piece of furniture. By the way, David, you, your team, and the men who delivered the piano did a wonderful job. Thank you for your all your help and interest. In the day of capitalism, it is refreshing to experience a company who places their focus on making sure the customer leaves with their dream fulfilled. Such a company is England Piano. A sincere thank you to you and your staff!! Yes the keys are smiling at me. It sounds just fine. Thanks again. David ... your moving service was excellent, according to my husband, Kelly! (I wasn't home) We were feeling very badly about the condition of our front entrance and maneuvering the piano through that. We just appreciate you picking up our piano. Thank you so much! David, to say I am enjoying the piano would be an understatement. The action and sound is so much more realistic than I thought I could get when I started looking in my price range. Thank you for having me at least try the CA series before I made a purchase. I just played for a couple hours while my son was napping. That's something I could never do with an acoustic. Thanks for your advice and expertise in helping to find my needs. Everything sounds great. Thanks so much for your help in choosing the right piano for my “blues” music. You are so spot on.....I have been playing it for hours today.....Doesn't it look perfect in its new home?